It has been some 26 years since a Coptic Pope visited Russia. That was back in 1998 when Pope Shenouda III visited Moscow to join in the Russian Orthodox Church’s celebration of a millennium of Christianity in Russia and the baptism of St Vladimir. Now Pope Tawadros II has just returned home from a visit to Russia that started on 29 October, during which he was warmly welcomed by Patriarch Kirill of Moscow and all Russia. “The heads of two ancient and significant Churches have stood side by side speaking in almost identical words of hope, unity and collaboration. This is only the beginning of what I am sure will prove to be an even deeper, stronger, and more effective relationship between our Churches.” These words, by Anba Angaelos, the Coptic Orthodox Bishop-General of the UK, summed up the essence of the visit. Accompanying Pope Tawadros were Metropolitan Bishoi of Damietta; Bishop Raphael, Secretary-General of the Holy Synod of the Coptic Orthodox Church; Bishop Serapion of Los Angeles; Bishop Kyrillos of Milan; Bishop-General Angaelos of the UK; papal secretary Fr Angaelos Ishaq; and the spokesman of the Coptic Orthodox Church, Fr Boules Haleem; Mother Edrosis, abbess of St Theodore Convent in Cairo; and Professor Ishaq Agban of Port Said Theological and Pastoral College. They talked about the relationship between the two Churches, ecumenical dialogue and the situation of Christians in the Middle East. Patriarch Kirill stressed the relevance of dialogue between the two Churches, which he said began in 1985 but was interrupted. He expressed his concern at the violence against Christians in Syria and Iraq and the Middle East. The two popes decided to form a joint bilateral committee that would be concerned with proposing a plan for regular dialogue and collaboration between the two Churches on the spiritual life, pastoral care, education and social ministry. Bishop Serapion of Los Angeles and Metropolitan Hilarion of Volokolamsk, Chairman of the Moscow Patriarchate Department for External Church Relations in Moscow will preside over the committee. Pope Tawadros presided over Holy Mass at the Armenian Church of St Catherine in Saint Petersburg, a church which dates back to 1708. During his sermon he talked about “living with Christ” and the unending joy He gives. The Pope met members of the Coptic community in Russia and Fr Thomas Ava Mina who is stationed there to look after their spiritual needs. The Church in Cairo, Pope Tawadros said, was considering the idea of establishing a Coptic church in Russia to serve the community there. 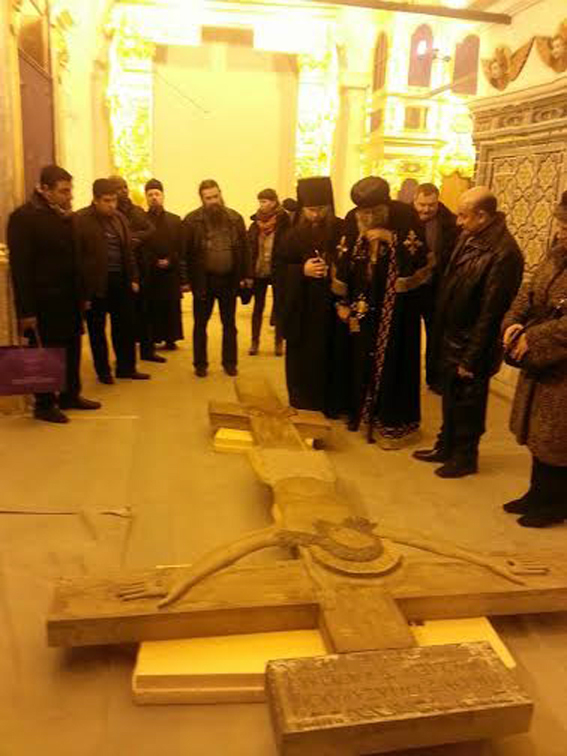 Throughout his 10-day stay, Pope Tawadros visited a number of Russian Orthodox churches and monasteries. He started with the Cathedral of Christ the Saviour, on the northern bank of the Moskva River, a few blocks southwest of the Kremlin. With an overall height of 103 metres (338 ft), it is the tallest Orthodox Christian church in the world. The current church is the second to stand on this site. The original church, built during the 19th century, took more than 40 years to build and was destroyed in 1931 during the communist rule of Joseph Stalin. The demolition was supposed to make way for a colossal Palace of the Soviets that was never built, so the church was reconstructed in the 1990s on the same site. The original church was the scene of the 1882 world premiere of the famous 1812 Overture by Tchaikovsky, written in 1880 to commemorate Russia’s defence against Napoleon’s Grande Armée in 1812. It debuted under a tent near the then unfinished cathedral which also memorised the 1812 defence of Russia. The 1812 Overture is best known for its climactic volley of canon fire, ringing chimes, and brass fanfare finale. The Pope’s tour took him to the Donskoy Monastery founded in 1591 to mark Moscow’s deliverance from Khan Kazy-Girey’s invasion. Commanding a highway to the Crimea, the monastery was intended to defend southern approaches to the Moscow Kremlin. The Pope paid a visit to the Intercession (Pokrovsky) convent in Moscow, known to have stood there since 1635. “It is good to exchange notes on the monastic tradition in our two Churches,” Pope Tawadros said. He extended an invitation to the convent’s Mother Superior to visit Egypt’s convents. Among the monasteries the Pope visited was the Novospassky Monastery, one the first to be founded in Moscow in the early 14th century, and the Trinity Lavra of St Sergius, considered the most important Russian monastery and the spiritual centre of the Russian Orthodox Church. It is situated in the town of Sergiyev Posad, some 70km northeast Moscow, and is currently home to over 300 monks. The monastery was founded in 1345 by one of the most venerated Russian saints, Sergius of Radonezh. No visit to Russia would be complete without a tour of the Kremlin in Moscow and the Hermitage in St Petersburg. True to form, His Holiness visited the Kremlin building which houses the Russian government, key administrative agencies and the Duma (Parliament). Later in his Russia visit, Pope Tawadros was guided on a tour in the State Hermitage, the world renown museum of art and culture in Saint Petersburg, founded in 1764 by Catherine the Great and open to the public since 1852. One of the largest and oldest museums in the world, its collections—of which only a small part is on permanent display—comprise over three million items including the largest collection of paintings in the world. The last day of his Russia visit took Pope Tawadros to the New Jerusalem Monastery in the Istra region near Moscow, founded in 1656 by Patriarch Nikon as a patriarchal residence on the outskirts of Moscow. The abbot, Father Superior Theophilactos, received the Pope and guided him around the monastery which is currently undergoing reconstruction.